Our reviewers present their Top Ten discs from the past year. Among the artists that show up on multiple lists are Buddy Guy, Tomcat Courtney, Moreland & Arbuckle, Marcia Ball, Kenny Neal, Homemade Jamz Blues Band, and more, plus M For Mississippi, a great documentary on the current Mississippi blues scene. All of the lists can be found in our Pick Hit section. Southern California's Mannish Boys, with their stable of great vocalists, are getting to be one of the hottest blues acts on the circuit today. 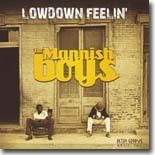 Their latest, Lowdown Feelin', is this month's Surprise hit. We look back at the lone release, Candy Lickin' Man, from the late Chico Banks. It's this month's Flashback feature. Our What's New section features new releases from B.B. King, Los Fabulocos, Cedric Burnside & Lightnin' Malcolm, Jim Suhler and Alan Haynes, The Nighthawks, Steve Howell, David Egan, and more.